Being in a burning building is quite possibly one of the scariest events one could face. The increasing levels of heat, poisonous gasses and falling debris can pose a serious danger. 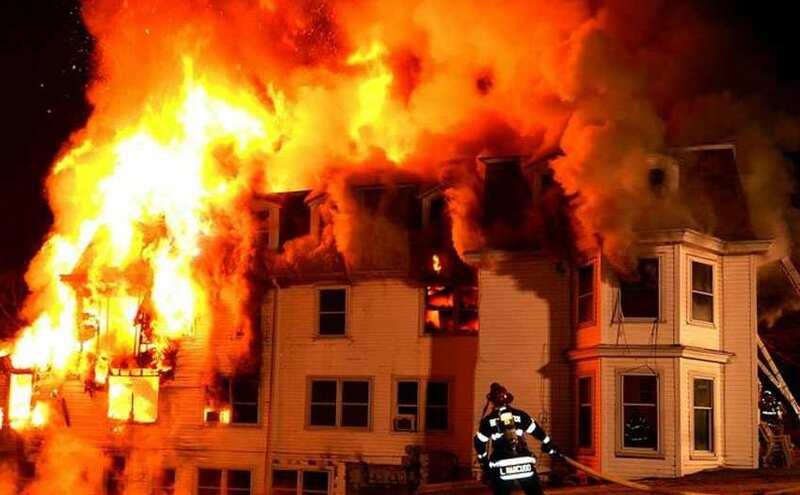 The most common response to a burning building is to exit the building in a timely fashion, but what happens if you find yourself trapped or blocked by objects preventing your escape? It's not only important to know what to do during a fire, but it's also essential that you prepare yourself and your family before a fire ever occurs. Whatever the cause, you need to follow these steps to keep yourself and those around you safe. Make sure you have an evacuation plan, including where you will meet your family members once outside the building. This is especially important in keeping track of those who have safely escaped the building, and those who may still be trapped inside. NEVER go back into a burning building to save anyone who you think may still be inside. That is the job of the trained firefighter and doing so may cost you your life. Make sure you don't overload any electrical outlets, as this may cause a fire. Make sure to keep all doorways, hallways and exits clear of obstacles. There is nothing worse than trying to leave a burning building, only to be trapped by objects preventing your escape. If you’re moving into a new home or apartment, make sure you develop a clear path for yourself in case there’s an emergency. Make sure you have a fire extinguisher close by. If you live in a relatively large home, then having two fire extinguishers is a good idea. If the fire is small enough and the fire extinguisher is close by, you may have the opportunity to put it out before it becomes lethal. Never tamper with smoke detectors, fire alarms or fire extinguishers. Store all flammable products in a safe location, preferably outdoors; your bedroom or furnace room should be avoided. Contact your local fire department or police station IMMEDIATELY! Even if you think a fire is small enough to handle on your own with a fire extinguisher, you still need to contact your local emergency hot line. What happens if your fire extinguisher isn't enough to put the fire out, and the fire keeps growing? The time you spend keeping the fire at low levels could have given the fire department additional time to reach you. If there is a fire alarm nearby, PULL IT! If you hear a fire alarm, don't take it as a test. Always act as if it's a real emergency. If you are enclosed in a room, always touch the door NOT the handle to see if it's warm. If it's not warm, you have the opportunity to leave and you should do so immediately. If you see smoke crawling under your door, try to place a piece of moist clothing or towel to block the smoke from coming in. The smoke itself will be a choking hazard and deprive you of oxygen. Giving yourself additional time could be the difference between life and death. If you find yourself trapped in a room, keep the door closed and open all windows. Make sure you place a sheet or some form of clothing hanging outside your window, preferably white. This will alert the fire department that there's someone in that room and appropriate action will be taken to bring you to safety. If you’ve escaped the burning building, be sure to keep your distance. A burning fire can cause a gas leak or build up pressure in the piping system, which could result in an explosion. Always distance yourself and try to recall who you were with. This will help the fire department determine if everyone has safely left the building, or if there are still people trapped inside.